Los Angeles, Feb 4 : Veteran actress Judi Dench never thought that she will win an Oscar as she was told that she will never become a star and was advised to stick to theatres. Dench is nominated in the best actress category at the 86th Academy Award for her role in "Philomena" after previously scooping a best supporting actress award in 1999 for her role as Queen Elizabeth I in "Shakespeare In Love". The 79-year-old admits the possibility of landing an Oscar nomination, let alone winning, never crossed her mind, reports femalefirst. co. uk. London, Oct 13 : Oscar winner Dame Judi Dench believes that young actors want quick fame and do not learn from their seniors in theatre. Speaking at the Times Cheltenham Literature Festival, the 74-year-old Dench criticised the new generation of actors for taking little interest in theatre. London, September 12 : Dame Judi Dench has confessed that she hates it when people complain about her swearing in movies. The veteran actress, who stars as Mona Carvell in new film ‘Rage’, is designated as a British national treasure. The 74-year-old revealed that she was disturbed earlier when the British Board of Film Classification published its annual report, saying her resorting to abuses onscreen prompts complaints from the public. London, Aug 17 : Dame Judi Dench is once again set to flutter her as fairy queen Titania in William Shakespeare''s A Midsummer Night''s Dream, 56 years since she first played the character. The 74-year-old actress first starred as Titania in a school production and went on to play her again in a 1962 stage show and the film version six years later. The veteran actress is set to tackle the role for a fourth time in a new stage adaption at the Rose Theatre in London. 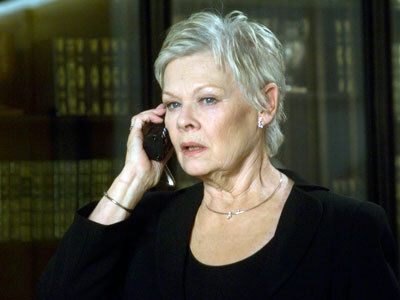 London, July 13 : Dame Judi Dench has been voted Britain's favourite female role model in a survey. Conducted for the A Woman of Substance Awards, the poll showed that 70 per cent of the 1,000 British women participants, between the ages of 18 and 65, took the veteran actress to be the woman who had real substance. The 74-year-old star beat fellow actress Joanna Lumley, followed by actress-novelist Julie Walters. Round-the-world yachtswoman Ellen McArthur bagged the fourth spot, and wrapping up the top five was British Queen Elizabeth II. London, June 24 : When it comes to actors swearing in films, the viewers can pardon any star other than Dame Judi Dench for using foul language on screen, according to the British Board of Film Classification (BBFC). The BBFC says that there exists a phenomenon, called the "Judi Dench factor", which makes filmgoers less forgiving towards Britain''''s most distinguished actress talk tough. Washington, Mar 26 : Hollywood actress Judi Dench, who twisted her ankle during a fall at the Wyndham theatre, has returned to the London theatre to rehearse for her play `Madame De Sade'. Judi was exiting the theatre after a long day when she abruptly fell and badly twisted her ankle. Judi, who was hospitalized after the fall, could not refrain herself from getting back to work after missing four rehearsals. She returned to the theatre on March 24, using a stick to aid walking. 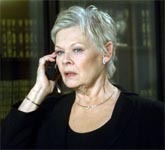 Washington, Mar 21 : British actress Dame Judi Dench was rushed to hospital after badly spraining her ankle in a fall. The Oscar winner was exiting the Wyndham theatre, where she is starring in new play Madame De Sade, when she tripped over a stage door and got hurt. The Casino Royale star has been forced to temporarily pull out of a new London play. She is now nursing an injured ankle and has been ordered to rest. However, she is determined to be getting back at work next week. London, Mar 6 : Dame Judi Dench and Dame Helen Mirren have been ranked among the 20 most powerful women in British theatre. The veteran actresses are among a clutch of stars including Rachel Weisz and Rosamund Pike to appear in the list compiled by Harper''s Bazaar and the jeweller Tiffany & Co.
American actress Gillian Anderson, who has been described as an ''honorary Brit'', also made it to the list. Washington, February 20 : British actress Dame Judi Dench, 74, once decided to show her gratitude to movie mogul Harvey Weinstein by baring her backside to show off a temporary tattoo she had inked in his honour. Dench has starred in a number of films produced by Weinstein, and even won a Best Supporting Actress Academy Award in 1999 for Shakespeare in Love. She has also garnered four other Oscar nominations for their work together. Washington, February 6 : Claustrophobic actress Dame Judi Dench has revealed that her fear of the dark keeps her from watching films in theatres. She has revealed that she can get through a screening only when her pals are around. She even says that she has not seen many a classic film owing to her fear of being trapped in the dark. Jerusalem, Feb. 5 : A top Islamic Jihad commander has been killed by Israel Defence Forces (IDF) special forces in the northern West Bank town of Kabatiya. Security officials said Ala Abu Rob, described as the organization''s commander in the town, had in recent months attempted to carry out terror attacks in Israel. He was also responsible for several past attacks. The Jerusalem Post quoted army sources as saying that troops entered Abu Rob''s home and, identifying him as armed, shot and killed him. They then found several ammunition clips and an explosive device in the house. London, Dec 8 : Hollywood actress Dame Judi Dench was honored with a Lifetime Achievement Award at the 21st annual European film awards in Copenhagen.